The typical patient is a middle-aged woman. Most patients have no history of trauma or inflammatory arthritis. There is a strong association with hallux valgus. The Thompson draw test demonstrates instability with the MTP joint flexed slightly and the proximal phalanx drawn up and down. It may be difficult to distinguish the pain of MTP instability from that of an interdigital neuroma. Indeed, Coughlin's series of neuromas had about 5% of patients who also had instability, and about the same proportion of Peck's MTP instability patients also had neuromas. Diagnostic injections are the simplest method of differentiating the two pathologies (Miller 2001). Ultrasound and MR will show both. The Thompson-Hamilton draw test. The MTP joint is in neutral. 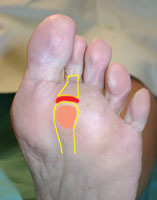 Dorsal and plantar leverage on the proximal phalanx subluxes and reduces the joint.